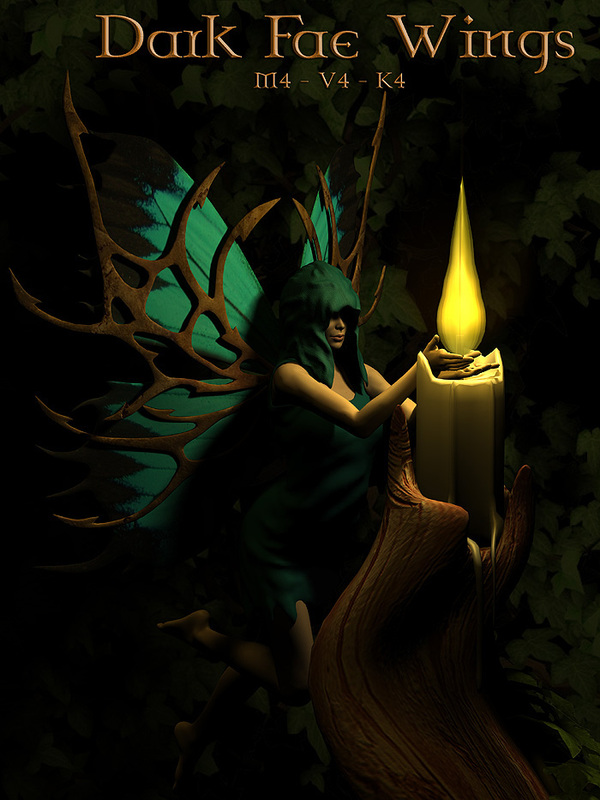 Fairie was originally a term meaning "enchanted" but has been used as a name for 'enchanted creatures' from as early as the Late Middle English period. A common theme in Celtic folklore describes a race of diminutive beings driven into hiding by the spread of humans. Traditionally, fairies were noted for their mischief and malice. Mortem Vetus are very proud to present 'Dark Fae Wings', for you to bring ancient folklore and myths to life. While our intention is to depict the darker aspect of fae folk, these wings are equally useable in a lighter context. Included are specific versions for Michael4, Victoria4 and Kids4, all presented as conforming cr2 figures. With 7 MAT poses for the main wings, and 5 MAT poses for the secondary wings, there is plenty of mix and match functionality, and the included morphs expand the customization exponentially.